Bloody Sunday, Vancouver - 1938: Recollections of the Post Office Sitdown of Single Unemployed (Vancouver: BC Young Communist League, 1974). Epilogue by Maurice Rush, edited with an introduction by Sean Griffin. 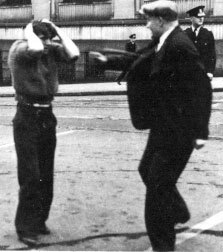 Photo of Steve Brodie being questioned by police after the Post Office sitdown ended.